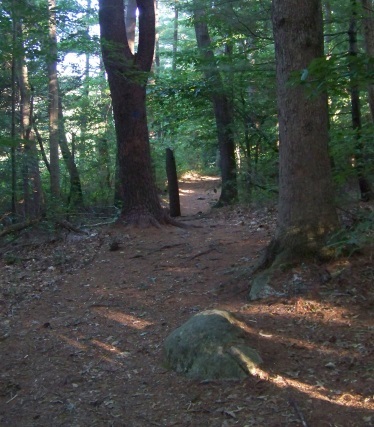 Here in the town of Norwell, it's hiking trails and conservation areas well reflect the character and beauty of the town. Like many towns on the south shore the North River helped to shape the town and provide part of it's industry. This river also forms the south and southeastern portion of Norwell's boundary. 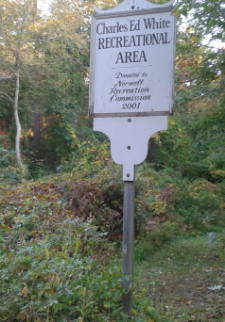 There are several considerably sized conservation areas here. Some entirely in Norwell and some shared with other towns. 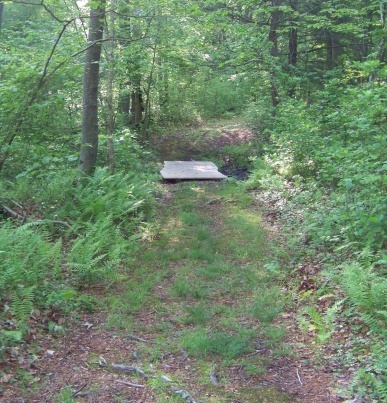 The southern most portion of Wompatuck State Park lies within the town of Norwell with an entrance at the end of Mt. Blue St and several access points from Prospect St.
Route 53 runs along the north western section while route 123 runs across Norwell east to west. 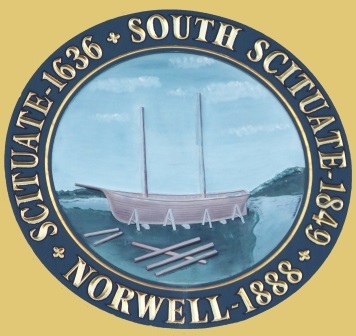 Norwell was first settled in 1634 as part of Scituate. The first settler was Cornet Robert Stetson. He lived on the North River, owned a considerable tract of land as many of those first settlers of a land did. Another first for Robert Stetson was to build a saw mill in 1656. Driving through the south shore one will find many references to Cornet Stetson. The word Cornet is an old English Military term no longer used. It is the same rank as the present day Second Lieutenant. Robert Stetson was a flag bearer of a light horse in a non artillery military unit. River and harvesting the salt hay that grew along it. Before the European settlers arrived, the Indian inhabitants survived by fishing on the river as well. In 1644 the North River Ferry was established where the Union St bridge now stands. Later in the early 1800's it became a toll bridge. In 1850 it became a possession of the town and the tolls were removed. Norwell, one of many towns dwelling on the North River was involved in shipbuilding as an industry. The town seal helps represent this aspect of it's history well. In those early ship building days, the river was a convenient way to travel and ship goods from one place to another. Those towns whose borders ran along the river thrived with business. Norwell was one of these towns. Records show that over 1000 boats had been built on the river. In 1670 the Wanton Shipyard was established. This was the start of the industry that shaped the town and lasted almost 200 years. In 1849 the southern portion of Scituate broke away and became South Scituate as noted on the town seal. In 1888 the town took it's current name of Norwell. The name came from a wealthy summer resident from Boston who was a dry goods merchant. Henry Norwell provided the funds necessary to maintain the roads in town. He did so for many years! Many of the towns and highways on the south shore could use a current day Henry Norwell! Previously in 1720, the Assinippi area of Norwell began to develop. A saw mill and grist mill were erected by David Jacobs. The third herring brook was damned to form Jacobs Pond. Later Elisha Jacobs built a brick kiln for brick making. The Jacobs Family seemed to have been very active supporters in the town of Norwell. In the early days, when the town was first settled and part of Scituate, farming was not thought a feasible endeavor. The land was not considered tillable. Instead farmers brought cattle down to the river to feed on the grasses along it. Again in the Assinippi area, another Jacobs family member in 1726 built a homestead that soon became a farm. The home and property were continually added on to. 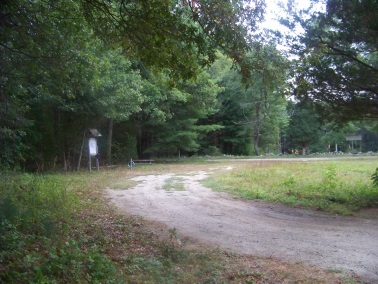 This same farm exists today as part of the Norwell Farms, bought with funds from the towns' Community Preservation Act funds and functions as a CSA (community supported agriculture). Farming and in particular poultry farming gained popularity in the early 1900's. The poultry farming became large and profitable enough to have a theft problem. The theft became serious and lead to the State Police Barracks to be formed and located in this town. The Barracks had several locations in town before settling in on the current location on West St.
As the years progressed the land that was originally thought not tillable, did support many a farm, as a drive through this still rural looking area will reveal. 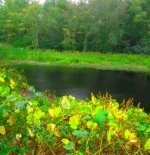 By the early 1900's most of the inhabitants of Norwell grew their own food! A small conservation area with extra areas to explore not noted on it's map! 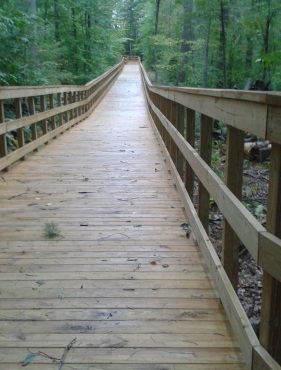 Explore the forest, fields and trails along the salt marshes of the North River. This area is full of historic value as well! Good steady stepping for any age! 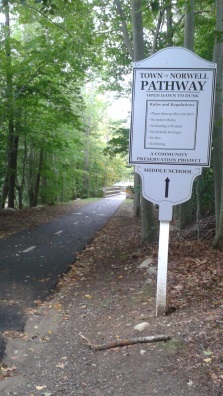 adds another connector trail leading out to Circuit St.